There’s stacks of scientific research to prove that food can play a huge part in improving our mood and overall mental health. Having read about Rachel Kelly’s experience of depression in her memoir Black Rainbow and her self-help guide Walking on Sunshine I was really pleased to try her new book about the power of food to promote better mood. 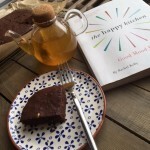 In The Happy Kitchen Rachel has teamed up with nutritional therapist Alice Mackintosh to share a wealth of recipes that helped her to manage her own depression and anxiety. Rachel tells her own story as a kitchen novice (her go-to meal being microwave fish pie) learning to create delicious meals to boost her mental health as well as nourishing a family. Don’t feel daunted if you’re new to cooking as Rachel guides you gently through the process and every recipe is very manageable. I also liked that each chapter featured 1 or 2 recipes marked “feeling fragile” for when you need something simple to prepare to help you feel better quickly. My 2 teens and husband have enjoyed the recipes too and I’ve made lots of them- always a sign of a great cook book! Our favourites so far are Salmon & Prawn Teriyaki Skewers, Satisfying Prawn Penne with Broccoli, Walnut & Rocket Pesto, Cinnamon, Almond and Lamb Curry, Tropical Vitamin C Smoothie, Chicken Pie and Warming Sweet Potato and Chickpea Curry. Last weekend I made the Dark Chocolate Brazil Nut Brownies which were a “feeling fragile” choice. Rich and gooey and packed full of healthy stuff like raw cacao, spelt flour and brazil nuts these dairy–free brownies were really simple to make and a yummy treat. They didn’t last long in our house. I think this is a brilliant book for anyone looking to nourish their mind and improve their mental health. I also think it is the perfect book for families with teenagers working through their own stresses and anxieties. Cooking and eating are great activities to bring families together in a positive space.